I suspect that I would hardly need to explain to anyone what a fern looks like - their cool, green, graceful appearance makes them a favourite of holders of foliage fetishes everywhere. What you possibly may not be aware with is that the classic fern is actually only part of the story. Odds are that the parent of the fern you next see growing in a pot or in a damp grove looked nothing like that fern, and if you took the spores of that fern and grew them, you may not recognise the product. Welcome to the world of alternating generations. Alternation of generations is actually something that all land plants indulge in. 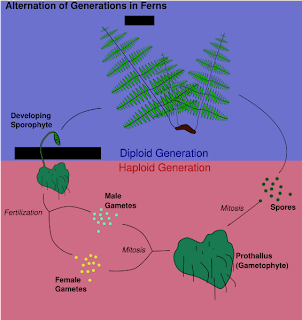 A diploid sporophyte asexually produces haploid spores that grow into haploid gametophytes whose haploid gametes fuse to form the zygotes that grows into new sporophytes, as shown in the diagram above by Jeffrey Finkelstein. In seed plants, the gametophyte has been severely reduced and does not grow outside its parent - the female gametophyte remains contained within the parent flower or cone as the ovule, while the male gametophyte is only a few cells in size and forms the pollen grain. In ferns, the gametophyte grows as a separate (albeit really small - perhaps only about a centimetre across) individual with an undifferentiated thallus. Each gametophyte produces both male and female gametes at different places on the thallus, and male gametes require a layer of moisture across the surface to swim across to the female gametes and fertilise them. Cross-fertilisation occurs when multiple gametophytes grow in close proximity and joined by a common covering of moisture. The sporophyte then grows directly out of the parent gametophyte. In the majority of fern species, the gametophyte is a small heart-shaped structure like in the diagram above. The meristem, the growing part of the plant, is restricted to the recessed point of the heart. In three fern families, though, the gametophyte is ribbon-like or filamentous with multiple marginal meristems and grows indeterminately. While gametophytes of other fern families tend to be short-lived affairs, the gametophytes of Hymenophyllaceae, Vittariaceae and Grammitidaceae can be much longer-lived. Dassler and Farrar (1997) recorded an individual gametophyte of the Hymenophyllaceae species Callistopteris baueriana still growing seven years after germination. What is more, some inderminately-growing gametophytes are able to reproduce asexually as well as sexually through the production of gemmae, side-buds that can detach and grow into new individuals (anyone who has owned a hen-and-chickens fern or a mother-of-millions plants may have seen gemmae growing along the edge of their leaves). For a very few species, this capacity for sexual reproduction has allowed them to bypass the sporophyte phase of the life-cycle entirely. The gametophyte-only fern species Vittaria appalachiana. Photo by Bob Klips. Currently, independent gametophytes (i.e. those that are able to establish populations without forming sporophytes) are known from a single species of Grammitidaceae, two Vittariaceae and nine Hymenophyllaceae (Lindsay, 2003). Most of these species also produce sporophytes over part of the distribution, but the gametophytes are able to survive in areas that are seemingly not conducive to sporophyte production. Vittaria graminifolia, for instance, is known in Louisiana only as gametophytes, with the nearest sporophytes of the species over a thousand kilometres away in Mexico (Lindsay, 2003). As yet, only three species are known that seemingly never produce sporophytes - Vittaria appalachiana, Hymenophyllum tayloriae and Trichomanes intricatum (Raine et al., 1991; Farrar, 1992). Nevertheless, there are good reasons to suspect that the diversity of unrecognised independent gametophytes out there might be much higher. Fern gametophytes have been studied much less than sporophytes - not only are they small and difficult to find, but they have generally been regarded as decidedly low on taxonomically useful characters. Vittaria appalachiana, the first-known gametophyte-only species, was actually discovered sixty years before it was confirmed to be identifiably distinct from sporophyte-producing species of Vittaria. It does not escape notice that all three known gametophyte-only species come from the eastern United States, even though the families involved are found in tropical and subtropical habitats throughout the world. Things become particularly suspicious when you realise that a single person, Donald Farrar of Iowa State University, has been privy to the description of all three. More than likely, the apparent absence of gametophyte-only species from other parts of the world does not suggest that there is something unusual about the eastern United States, but simply that no-one has really looked anywhere else. Like the relationship between asexually- and sexually-reproducing fungi, the taxonomic and ecological implications of the independent gametophyte may be significant. Rumsey et al. (1999) demonstrated that the Killarney fern (Trichomanes speciosum), previously regarded as extremely rare in the British Isles based on the distribution of the sporophyte, was actually fairly widespread and common as the gametophyte. The wide distribution of the eastern North American Trichomanes intricatum, including areas previously subject to glaciation and despite the apparent low dispersal potential of gametophytes reproducing by gemmae only, led Farrar (1992) to suggest that the "extinction" of the sporophyte form may have happened only recently. Has this species really forever lost the ability to produce sporophytes, or might a change of climate lead to the unfurling of a long-forgotten frond deep within the forests of New England? Dassler, C. L., & D. R. Farrar. 1997. Significance of form in fern gametophytes: Clonal, gemmiferous gametophytes of Callistopteris baueriana (Hymenophyllaceae). International Journal of Plant Sciences 158 (5): 622-639. Farrar, D. R. 1992. Trichomanes intricatum: the independent Trichomanes gametophyte in the eastern United States. American Fern Journal 82 (2): 68-74. Lindsay, S. 2003. Considerations for a revision of the fern family Vittariaceae for Flora Malesiana. Telopea 10 (1): 99-112. Raine, C. A., D. R. Farrar & E. Sheffield. 1991. 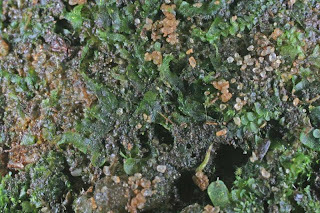 A new Hymenophyllum species in the Appalachians represented by independent gametophyte colonies. American Fern Journal 81 (4): 109-118. Rumsey, F. J., J. C. Vogel, S. J. Russell, J. A. Barrett & M. Gibby. 1999. Population structure and conservation biology of the endangered fern Trichomanes speciosum Willd. (Hymenophyllaceae) at its northern distributional limit. Biological Journal of the Linnean Society 66 (3): 333-344. Phylogenetic Nomenclature - Oui ou Non?